MIDI Voice Controller is an audio to MIDI converter that converts the pitch of your voice (or musical instruments) into MIDI note signals. 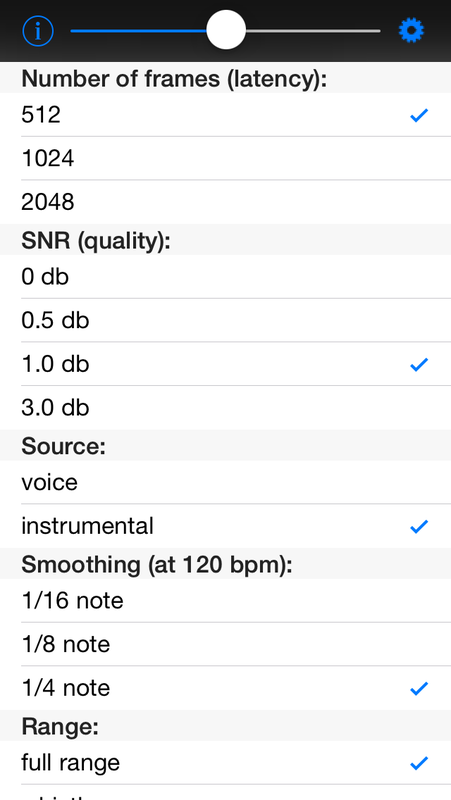 The app detects one pitch at a time (i.e., melodies only). MIDI signals can be used to control synth apps running on the same iOS device, or on other networked devices and computers. MIDI Voice Controller is Core MIDI and Audiobus compatible. The following examples were captured on the iOS simulator driven by an iPod. MIDI Voice Controller is shown running on the left. MIDI signals from the app drive Garage Band which is on the right. 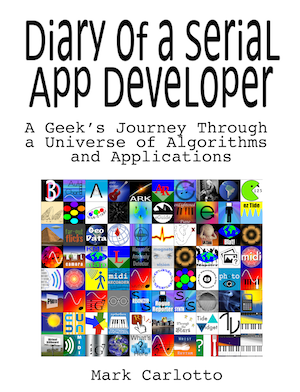 The first example contains several classical music samples. The first two are sections from Bach's Partita in A minor for flute. The last one is a section of Bach's Invention in D minor which contains two melodic lines. Notice how the app follows the more dominant line. The second example contains two jazz samples. The first contains vocals, the second trumpet, piano, bass, and drums. Notice how the app pulls off key notes that can be used to texturally embellish the music. Adjusting the top slider changes the input level. Sing or play into the device and adjust the slider until the pitch detector triggers. The detected note is displayed at the top. The pitch detector works best for monophonic music - a single voice. 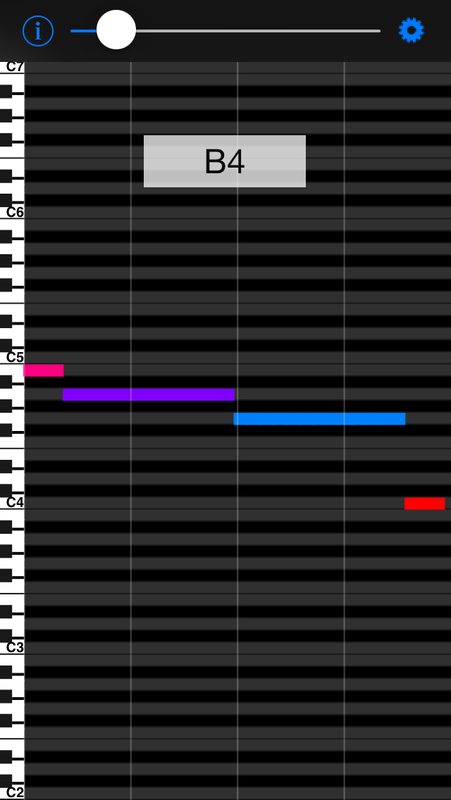 Detected notes are displayed in "piano roll" format. Note that if you are using a microphone headphones are required to listen to the MIDI driven sound; otherwise feedback will occur. Tap the gear icon at the upper right to expose the settings. Lower SNR settings are best for voice. MIDI Voice Controller uses several types of pitch detector. When "voice" is selected an auto-correlation algorithm is used. For instrumental music the outputs from three algorithms: auto-correlator, zero-crossing detector, and gammatone filter bank are combined using "or" fusion. Increasing the time window reduces spurious notes. Other settings allow you to restrict the detected MIDI notes. For example, selecting "major scale" and "C" recognizes and sends only the notes of a C major scale. If you sing or play another pitch it is reassigned to the closest note. Some experimentation is required to determine the best settings for your application. Midi Bridge or a similar app is required to route Midi signals between apps. Follow the directions below for wireless control of networked computers. Select your device and click Connect. As you sing or play into the device the bar graph will show the latency. Be sure to install the latest version of iTunes, which contains Bonjour for Windows. 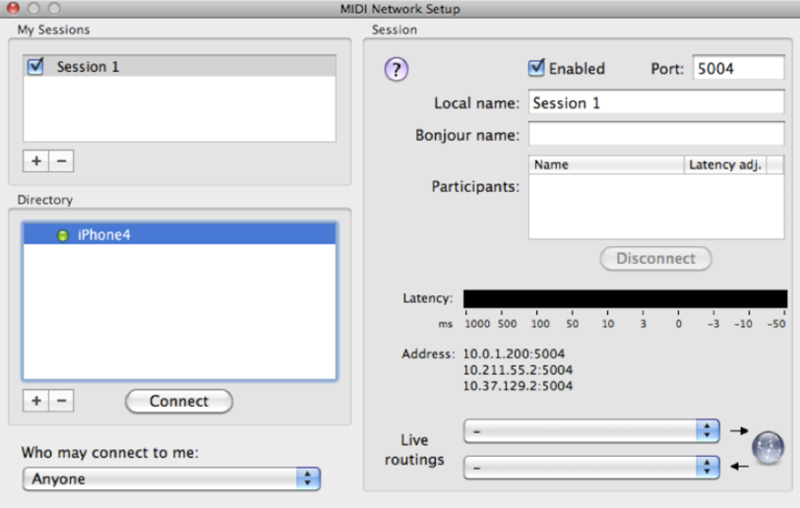 Then install rtpMIDI, which is available free at: http://www.tobias-erichsen.de/rtpMIDI.html. rtpMIDI on the PC looks and functions like Audio MIDI Setup on the Mac. 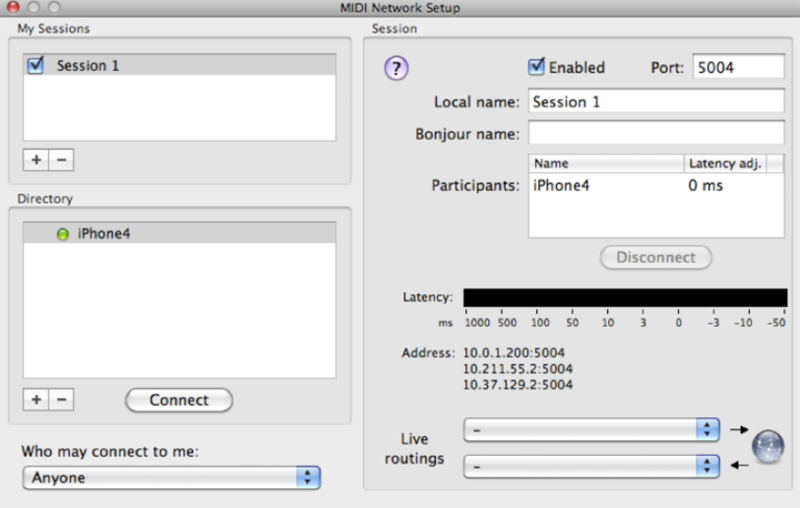 rtpMIDI will detect your iPhone/iPod touch when Voice Control is running. Start a new session in rtpMIDI and then you will be able to select the session as a MIDI input device from within your DAW or other MIDI setup. Start singing or playing. You can even harmonize with others on the same wireless network using two or more Voice Control apps.